Ever witness a boating accident? Out on the ocean all day yesterday and had a great time. 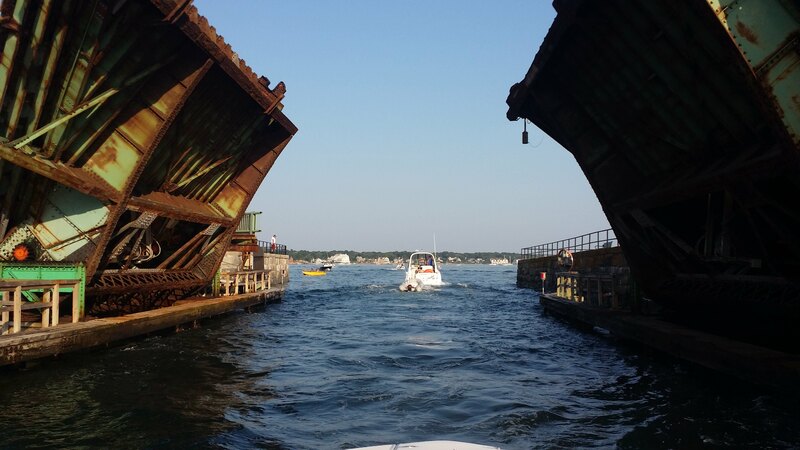 We planed smoothly at 30 mph all the way up to Gloucester and got to the Blynman drawbridge to enter the Annisquam River to head up to Wingaersheek Beach. The weekend prior to 4th of July is always jammed with boats in the harbor and the river....forget about it. Every single boat imaginable from Formula 45PCs to Searays of every single type to runarounds to mahogany Christ Crafts to even a spectacular Azimut 50 flybride and everything else in between. Once you get to the drawbridge, need to wait until the siren stops car traffic (which could take 15 minutes) then wait another 10 minutes for exiting boat traffic before we're allowed to enter. Depending on what size boat is in front of you and the wake it leaves behind that ends up slamming the drawbridge walls and coming back in at you, you could have a rough go at it or you could have a relatively easy slide-through. Still, you need to find that sweet spot of speed, path and control to make it through without getting shoved into the walls. It's definitely stressful. Of course, the bigger the boat the easier it is not to be greatly effected by the wake but the smaller the boat..............................and that's what happened in front of our eyes. 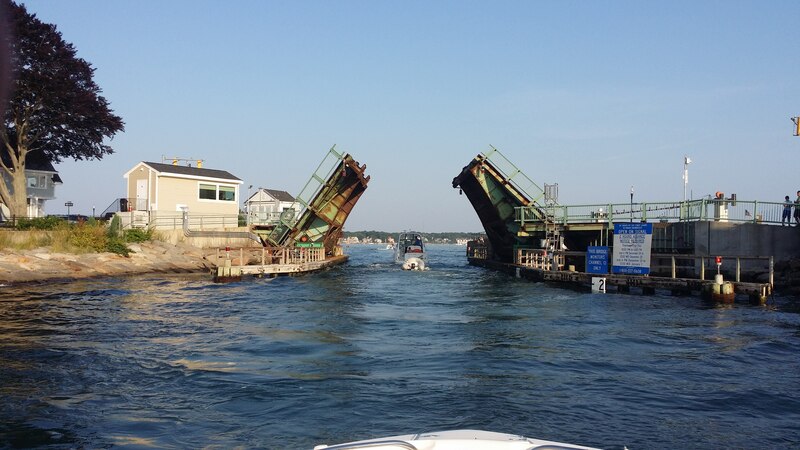 On the way out, we were stuck in a caravan of 20+ boats and we were 2nd in line at the drawbridge. We had to wait for incoming traffic first and lo and behold, there's a HUGE FERRY TRYING TO GET THROUGH! I swear, he must've had 6 inches on each side and he was gunning it. Left a wake that turned the boat in front of us completely around (20ft Boston Whaler) and almost shoved us into the rocks on the river's edge. While the boat in front of us was trying to spin back into forward position, had to wait for another little boat to follow the ferry, about 8 or 10 feet long with a small outboard and captained by a young grandma, her husband who decided to take all the grandchildren with them, maybe 6 of them! We watched her try to gun it after that ferry only to have the monster wake that was left behind push her completely over where she hit the right side almost head on! Saw grandpa grab one or two kids from taking a header into the mess of water when suddenly, the momentum of the smack and grandma probably keeping full throttle on the outboard just bounced back off and straight into the other side of the walls! We watched in horror. People crowded over the bridge watching this whole incident take place and finally, after crashing twice, grandma got control and eased off the throttle and propped through. Once they came by us, my wife yelled out to them to see if they were ok and you can tell, everyone besides grandpa were in shock. Felt really bad. Never seen anything like that in the past 4 years of boating. Have you? I felt really bad for grandma and you can tell everyone in that boat was shaken up really badly. You really need to understand the effects of rough water from other boats and really understand how to handle your boat and be very aware of your surroundings out there. This is the Blynman drawbridge. While really scenic and a neat place to boat through, take a look at the wake against the walls after the boat @ minute 0.30. And this is weekday traffic, so imagine 50 boats in line, one after the other from both ends. 2nd busiest drawbridge on the eastern seaboard, after one in Boca Raton. Only a harmless rental of beer drinking by 20s . 1 mile from the rental dock.. Drove on a ledge as I waved. They raised their beer cans in salute. as the came to a stop. You'd think that would be a no-wake, 6 knot zone. Oh there definitely is, 5 mph but because of the narrowness and the wakes, most boaters have no choice but to step on it a little bit to get through that rocky turbulence. It's actually very tricky when there's heavy traffic. But yeah, it is crazy lol. Yeah it is. That blue sign posted there. Plus no one actually follows the light signals when it gets really crowded and chaotic. We had no choice but to go through it when it was a red light because traffic was moving and what was I supposed to do, stop with 18 boats behind me? They would've killed me. I had to waive "sorry" to the bridge attendant and he just waved "hello" back loool. The boat with grandma and grandpa and 6 grandchildren bouncing full throttle off the walls reminded my son and I of this crazy incident that happened a few months back. I do understand the occasional need to step it up a bit, but those larger fishing boats blasting thru there, on full plane, is ridiculous. All bridges, at lest everyone that I have seen. Has a No wake zone around it. On the right side of the bridge has a no wake sign. On the right side of the bridge has a no wave sign. Many (at least on lakes) do not. Our lake has at least one that we all routinely go under on plane. It's essentially a freeway with probably 20 or 30 sets of pylons down the length of it. So you have no "walls" and therefore not a problem with the wakes. I agree. I've been through that cut maybe a dozen times and most of the times we try going through it during a weekday when it's not too crowded and even then, for some ecological reason, either due to the flow of the water coming out of the river into the harbor or the other way around, even if it's calm, there's a brutal current that can pull you to one side or the other. I think that's the reason most of these boats fly through it like lunatics. I just find that "just fast enough" to be able to correct the bow one way or the other but man, talk about standing hairy ball bags every time lol! How ironic is that boat name? He didn't say where it was but people were guessing Wood's Hole or Nantucket, where all those sports personalities love to go hang out with Bill Bellichick and Co. Those outcropping rocks scare the living crap out of me and I stay the heck away from them as far as possible. I can't figure the clowns that go blasting over these known hotspots like they don't exist simply because they know it's high tide, and plaining gives them that little bit more added height. Numbnuts. Drunks and druggies have fun at night moving the markers. We now have 1 marker on some shoal 1/2 mile long. Used to have 3 or 4 on it. Memorize those accurate shoal charts. I do not trust a goof ball in Mongolia writing a electronic shoal map for my area. All my charts are way before electronics. Plastic covered paper ones. Over the decades the freighters have snapped off the tall skinny spikes of rock on the channel edges. They are now Xs on my charts. That's waaaaaaaaaay too old school for today's crowd and millennials, ma man. With this video game and phone apps generations, it's too much work to actually pull out a chart, look at all that overwhelming detail, make notes and then learn where those areas visually correspond!? Oh ma goodness. Must be able to touch a screen and be shown and told not only what is where, but how to best maneuver around it. Everything must be handed over in the easiest way possible. I can only imagine what Boston harbor is going to be like tomorrow as we head in there. 4th of July is going to be a bum #&#036;%&#036;&amp;&#036;% crazy boating bonanza boatapalooza. Gonna have my head on a 360 degree swivel! Hope there's some military vessels docked for the occasion. That usually brings out BPD and the USCG to keep everyone in line. Good thing we don't have these guys around here! Looks like a fat person mooning you. I can't believe the traction that thing had in the water! Don't they have hoofs?! Might not be a cut bridge, but this inlet in Miami is insane. Look at how some of those center consoles gun it through that rough. Crazy bastards, but it might be the only way to deal with the out of control water. Those are riffles for a short distance. I Remember the several 10 ' plus standing waves in the 1950s in several N J inlets. You timed you runs to the tides because the boulders in the inlet bottom were so big. You did not go out in any approaching storm weather. The uneven bottom would eat a 60' off shore racer gunning it. Went through the drawbridge again on Monday. This time it wasn't anywhere as bad as that weekend before the 4th of July. That was some crazy @#&#036;%@#! Much calmer and a lot less traffic during a weekday, even though the weather was screaming with this awesome heat wave we're experiencing right now. The best boating weather. Hope it lasts for another 10 years. Going into it from Gloucester harbor. Had to wait for a sailboat instructor team to tow out their students. Low tide and water level had dropped about 7ft. Once you get past the bridge, the river depth right at that beginning stretch of the Annisquam River is barely 3ft at low tide. You really have to be careful and stay right in the middle of the channel. Coming back out tide was almost all the way in and it wasn't as bad either. Guy in the Sea Ray in front of us was towing his dingy so he was moving really slow. It was a bit irritating but it he hardly created a wake behind him which made it that much calmer for us to go through. So who's at fault here? A charter fishing boat wound up sitting atop a sailboat it T-boned in a collision in Chesapeake Bay recently and the stunning photo begs the question, how can this happen? None of the seven aboard the Chesapeake Bay Charter Services boat and neither of the two on the sailboat were injured, and the crash is still under investigation to determine who was at fault. Michael Andorsky, the 74-year-old who was at the helm of the J/105 sailboat, told the Capital Gazette that he isn't to blame while Chet Clough, owner of the fishing charter company, refused to comment on the ongoing investigation. On a clear day in the bay on Aug. 17, Andorsky was sailing with a friend aboard a boat from the Chesapeake Boating Club in Eastport when he noticed a powerboat in the distance that appeared to be on a collision course. Androsky said that he stayed the course since motorboats usually give right of way to a sailboat. "I'm waving at the guy, yelling, and all of a sudden his boat was sitting on top of our boat," he told the Capital Gazette. Andorsky and his friend were in the stern. Had the fishing boat made a direct hit of the stern, he believes they would have been killed. After the collision, the people in the charter boat were above them, looking down at them. They asked if everyone was OK.
"I was just thinking that this is ridiculous, but how lucky we both are to be able to talk about it," he said. At home, Andorsky let his wife get used to seeing him, looking perfectly unscathed, before telling her what happened. "I was perfectly, 100 percent A-OK," Andorsky added. "The question is, is it just a matter of dumb luck or something else? It's like they say, the expression, there are no atheists in foxholes. When you have a near-miss … you wonder if there was somebody looking over you." Photo courtesy of the Maryland Natural Resources Police. Must be a Maryland thing. There is no right of way. There is a leeway side for sail boaters. Two power boats, the boat on the right has the stand-on way. But BOTH boats must try a avoid each other. I know, it sounds like common knowlage, but true. The boat on the right MUST do what he needs to do to avoid the collision. Where we are, the sailboat has the ROW. Actual "right of way," Curt? I only ask because you're going to get the usual banter about "no such thing as right of way in boating" followed by a description of how one vessel is the give-way and that both have to avoid collision etc. But in that above situation, it's tough not to blame the charter motor boat since the sailboat had it's sails up and the charter basically T-boned it. Even if there is no ROW, someone will be found at fault. We were coming in offshore and once we hit the inner bay, we decided to go gas up in the harbor next to ours so I turned a bit to starboard doing about 20mph and to my far right was another boat gunning it the same direction and at the same speed. You could tell our directions were going to converge at some point but he started picking up his speed, so I did as well. 25, 27, 28, 29 30 and I ended up behind him and he was pulling away, so I gunned it even more lol. I'm watching the tack and I'm seeing 35, 38, 39 and waiting for 40mph and I look up and see we're catching up but suddenly he goes into neutral because he reached the no-wake zone. I yelled out to my passengers to hold on and had to slam it into neutral as well and move to the right a little bit, or I would've rode right into his stern lol. Ended up almost beside him and then trying to get back in lane I see another boat behind us who took my pervious spot because he was doing the same thing!!!! That could've easily been a 3-boat pile-up. Here, perhaps unique to where we live, there is a DMV handbook covering inland water. These rules are enforced by various state and local law enforcement agencies. Non-motorized has the ROW and motorized must yield and avoid. When multiple motorized, right has ROW. Are all aware? Do all follow? No, not by a long shot. But, enforcement happens and tickets are given. Perhaps other areas are different. The sail boat has the stand on way. Because he is less maneuverable. This gets a little crazy do to this fact. So if a 200ft motor yacht is on your left and your on your 34ft or less boat. He now has the stand on way. To be very honest, I would never race another boat. I might speed up to over take him. But if he did the same, pull back. Its not worth it!! As Curt said "Are all aware? Do all follow? No, not by a long shot."